The possibility of a handful corporations monopolizing healthcare and agriculture in the developing world is a very real risk today. Posted Mar 27, 2018 by Eds. The long-term costs of allowing a handful of corporations to take over healthcare and agriculture in developing countries, in exchange for vaccinations and hybrid seeds sold at discounted price, is likely to be a forbidding one—one that the populations of the Global South will be suffered to pay once the process of monopolization is complete. The possibility of a handful corporations monopolizing healthcare and agriculture in the developing world is a very real risk today. 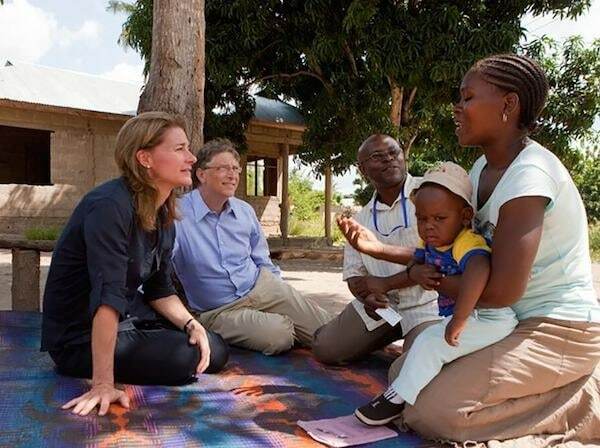 Closely associated with these corporations, the Bill and Melinda Gates Foundation (BMGF) – the richest and the most powerful philanthropic foundation shaping these sectors globally – aids them in the process of monopolization by granting huge funds to its network of NGOs to carry out activities which mainly benefit these selected corporations, in many of which the foundation has considerable financial stakes. Apart from making such grants, through the vehicle of Public Private Partnerships (PPP), the foundation also has been facilitating the flow of millions of dollars of taxpayer money into what are essentially private projects. The foundation also plays a crucial role in lobbying for stronger IPR regimes which oblige developing countries to grant long patent periods for drugs which are only minor alterations of already existing, off-patent drugs. In Africa, this foundation is one of the most powerful forces that is arm-twisting governments to gradually rewrite seed laws to provide patent protection for commercial seeds, which would eventually require criminalization of all non-certified seeds. Global Alliance for Vaccines and Immunization (GAVI), a Public-Private partnership (PPP) founded in 2000 after an initial pledge of $750 million by the BMGF, is today the most prominent force shaping the vaccine market in the Global south. Millions of dollars, not only of private philanthropic grants but also public money, have been transferred through this PPP to some of the largest corporations associated with the foundation. The extent of public money flowing through this PPP is evident in the fact that 80% of GAVI’s finances are paid by donor states. Only the remaining 20% are coughed up by private donors – mostly the Bill and Melinda Gates foundation which holds a permanent seat on the board of the alliance, along with UNICEF, WHO and the World Bank. Two seats on the board are reserved for representatives from the vaccine-manufacturing corporations, the remaining being held for limited time periods by independent individuals and representatives from governments and civil society organisations. One of means through which GAVI finances distribution of pneumococcal vaccines is called Advance Market Commitment (AMC)– a system through which the UNICEF calls upon manufacturers for “a 10-year commitment to supply a share of the target demand of 200 million doses annually at a price no higher than $ 3.50 per dose”. This mechanism allows AMC-registered producers whose applications are approved to secure a market in developing countries for 10 years, with no threat of competition. Countries whose average Gross National Income (GNI) per capita over the last three years is $1580 or less are eligible to apply for financial assistance from GAVI. This allows the countries to procure specified number of vaccinations by paying a fraction of this price of $3.50 per dose, the remaining being paid by GAVI. When the per capita GNI of a country receiving GAVI’s support for routine vaccines rises over this eligibility threshold, it enters “the accelerated transition phase” in which financial support from GAVI is phased out over a period of 5 years, following which the government of that country is obliged to purchase the remaining number of doses specified in “Secretariat’s decision letter”, at the full price of $3.50 per dose. Any country failing to comply with this obligation will be deemed a defaulter, which carries with it certain penalties, which may include not only the suspension of support for the relevant vaccine but also of other services on which the country may have developed a dependency on GAVI. “To come out of default, a country is required to fulfil the co-financing requirement of the current year together with the first tranche of arrears payments relating to the previous year as agreed in the payment plan”, GAVI’s co-financing policy document (Version 2.0) states. For the first years after AMC became functional, double the agreed price of $3.50 per dose was offered by GAVI to the manufacturers “to tempt companies in”, Guardian reported. And the names of the companies thus tempted is no surprise. The conflict of interest arising from the foundation’s close relation with GSK is explained in a previous article. Even in Pfizer, according to a report, the foundation’s trust had investments as on 2014. In 2015, Pfizer’s senior vice-president, Emilio Emini was appointed as the director of BMGF’s HIV for the Global Health program. This choice to subsidise some of the world’s biggest pharmaceutical companies associated with the foundation, rather than using the money to help generic companies in India, China and Brazil that produce pharmaceutical products at a much cheaper price, has repeatedly come under criticism by MSF and Oxfam. Far from aiding the production of cheap drugs by generic pharma through means such as technology transfers, the corporate giants, including Bill Gates’ Microsoft, “lobbied vociferously” for acceptance of TRIPS agreement, which obliged member countries to agree to grant patents to pharmaceutical companies for a minimum period of 20 years. Microsoft again lobbied the G8 in 2007 to strengthen the protection of global Intellectual Property Rights (IPR), which, Oxfam warned, is bound to “worsen the health crisis in developing countries”, the New Internationalist reported. Stifling the development of generic pharma by lobbying for stronger Intellectual Property Rights regime (which, contrary to incentivizing innovation as is widely claimed, has the opposite effect as demonstrated by many empirical studies including one by U.S government); facilitating a flow of enormous subsidies into private projects of closely associated pharmaceutical companies, not only by making philanthropic grants but also by channelizing through GAVI alliance the public money granted by various states; and protecting selected corporations from potential competition in the market by locking countries receiving assistance through this programme into long-term commitments to buy vaccinations they manufacture – all appear to be a multi-pronged strategy to monopolize the global healthcare industry. And being “the single most influential voice in global health”, Bill Gates is more than well-qualified to be at the helm of this machine. Lobbying for IPR for seeds is carried out through a network of non-profit organisations, one of which is African Agricultural Technology Foundation (AATF). As on 2016, AATF had received almost $118 million in grants from the Gates foundation, apart from the grants its receives from other bodies including DFID and USAID. Founded in 2006 with grants from Bill and Melinda Gates Foundation and the Rockefeller foundation, the Alliance for a Green Revolution in Africa (AGRA) is another key organisation pushing patented seeds in the region. This organisation, which the Gates foundation has called the “African face and voice of our work”, has been lobbying African governments to introduce IPR for seeds in multiple ways, including drafting revisions to national seed policy of Ghana and submitting it to the government – a move that has evoked fierce resistance from Ghana Food Sovereignty Network. In Tanzania, AGRA’s Seed Policy Action Node has “reviewed national seed policies and presented a study on the demand for certified seeds.” Last year, AGRA has received $200 million in grants from BMGF. Lobbying for IPR is not the only way by which AGRA serves the interests of some of the largest agribusiness corporations. It also supports a network of agro-dealers, which act as a conduit through which Monsanto (now attempting to merge with German chemical company Bayer) sells all its seeds and herbicides in the region, as admitted by the company’s country manager in Malawi. In order to get the promised yields from the hybrid seeds circulated in Africa through AGRA, the farmers need to buy the required quantities of chemical inputs. 67% of all these inputs sold by agro-dealer networks supported by AGRA are that of Monsanto. In the three years between 2007 and 2010, these agro-dealer networks sold 10,908 tonnes of seeds and 18,071 tonnes of fertilizers, achieving an 85% increase in sales, according an evaluation report perused by Global Justice Now. Monsanto, which benefited the most from these sales, is a company in which the foundation bought 500,000 shares worth $23 million in 2010. Though the foundation has reportedly sold its Monsanto shares in the end of 2011, it was revealed by Warren Buffett last year that his Berkshire Hathaway – in which foundation’s trust holds almost 60 million shares– has acquired over 8 million Monsanto shares, worth $846 million. The overlapping of interests between the foundation and Monsanto is not limited to the foundation’s financial stake in corporation, but extends to common personnel, as is the case with GSK in the world of pharma. Rob Horsch, who was previously the “the leader of International Development Partnerships at Monsanto”, has been appointed the Deputy Director of Agricultural Research and Development team at the Gates foundation since 2006. The purpose of labouring this point that BMGF is one of the vital agents facilitating the ongoing process of monopolization of the global healthcare and agriculture is not necessarily to deny any positive impacts the foundations’ interventions may have had. It is instead to warn that the long-term costs of allowing a handful of corporations to take over healthcare and agriculture in developing countries, in exchange for vaccinations and hybrid seeds sold at discounted prices, is likely to be a forbidding one – one that the populations of the Global South will be suffered to pay once the process of monopolization is complete.